Back in Delhi I had most of the day to sight see before I had to catch a flight, and decided to see The Red Fort and Old Delhi with the time I had. 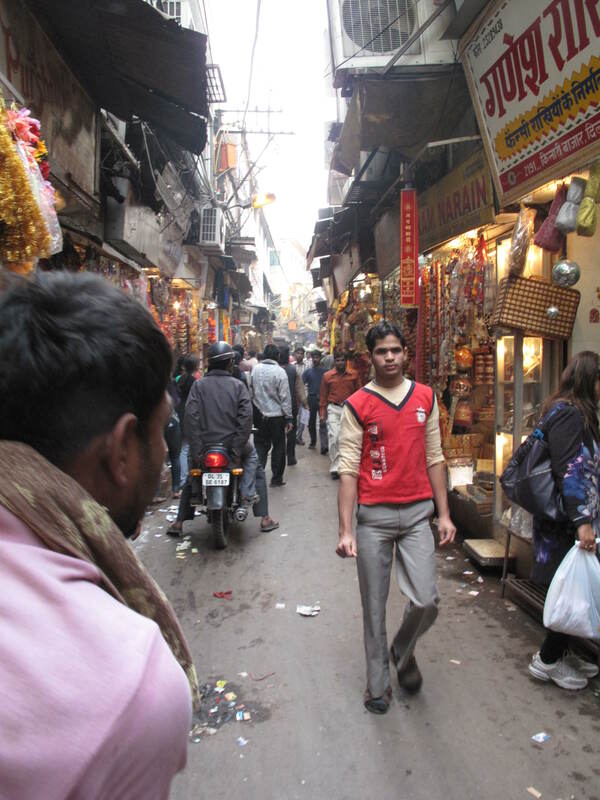 What is the difference between Old Delhi and New Delhi? 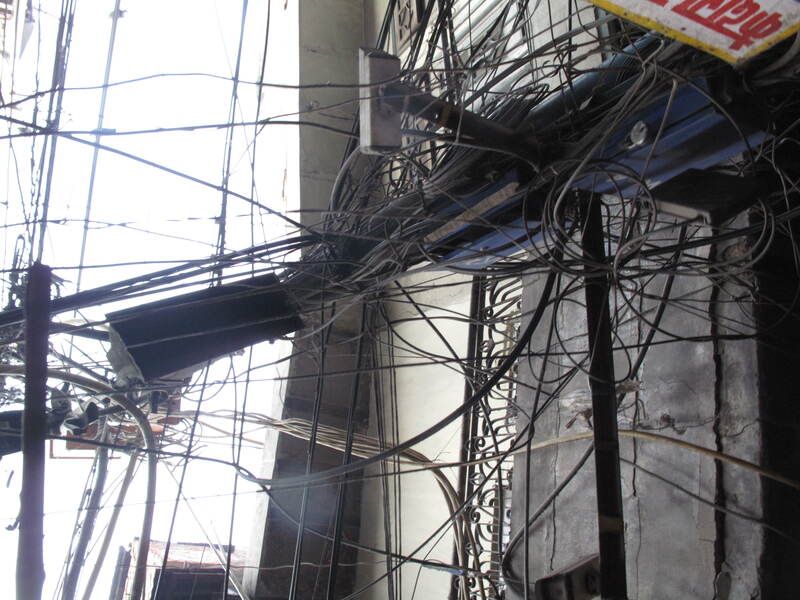 Old Delhi is – older, a crazy maze of narrow streets full of every kind of shop and a crazy tangle of electrical wiring. New Delhi is newer, built by the British when they moved the capitol of India from Calcutta to Delhi. Despite being newer, Old Delhi is undergoing a massive face lift in preparation for the Commonwealth Games that will be held in October of this year. India being India, I doubt that construction will be finished before then. 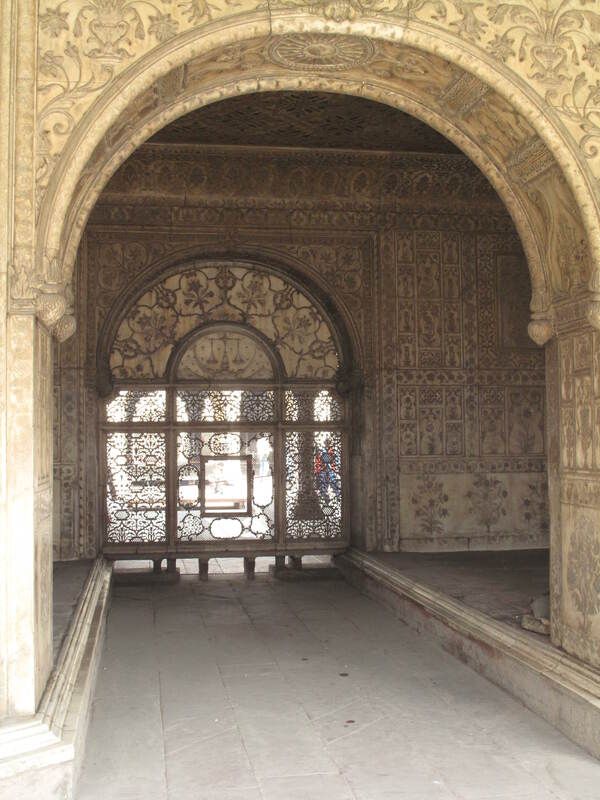 The Red Fort, a large palace complex, built by Shah Juhan and modeled after the Red Fort in Agra, was designed by the same architect that built the Taj Mahal. In many ways I enjoyed the Red Fort in Delhi more than in Agra despite the fact that the beautiful buildings are in bad shape, having been looted, or are simply falling apart. The old gardens are now a wide lawn. It is the kind of place that you could bring a book and take a nap in the sunshine and from my experience in Delhi these places are rare. 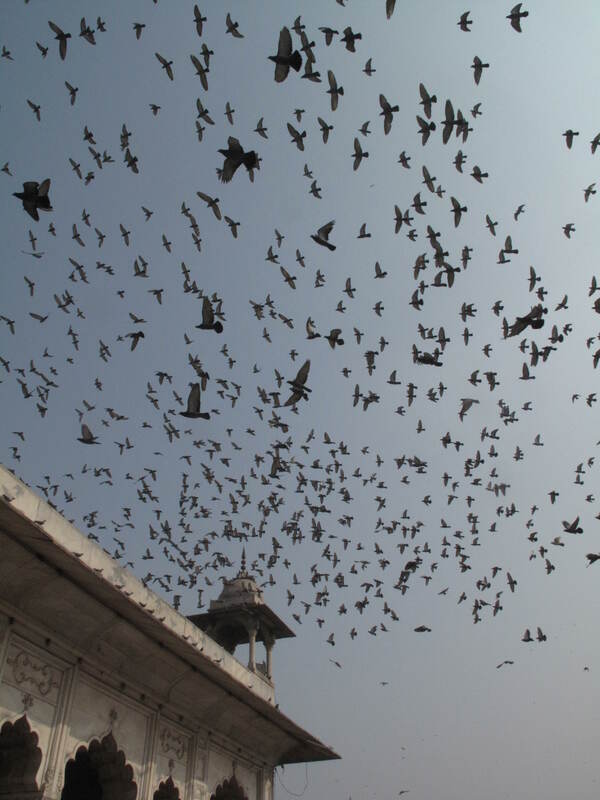 Unlike monuments in America, where they try to keep the pigeons off of national monuments, in India they feed the pigeons on top of some historic buildings. 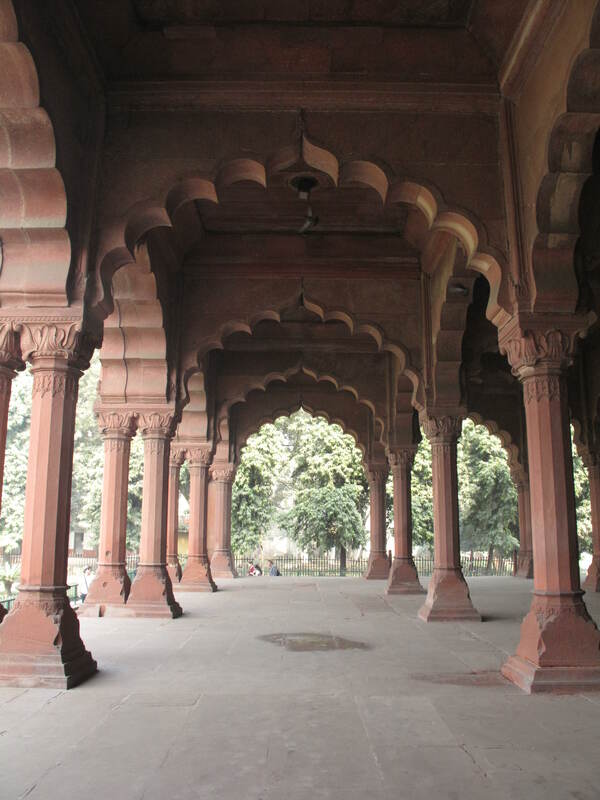 The pigeons at the Red Fort might live in the most beautiful pigeon coop in the entire world. The Red Fort is a popular place for school field trips and often when passing a line of school kids many would say hi to me and sometimes offer to shake my hand. This was a refreshing contrast to the guilt ridden interactions I have had with street children who beg. 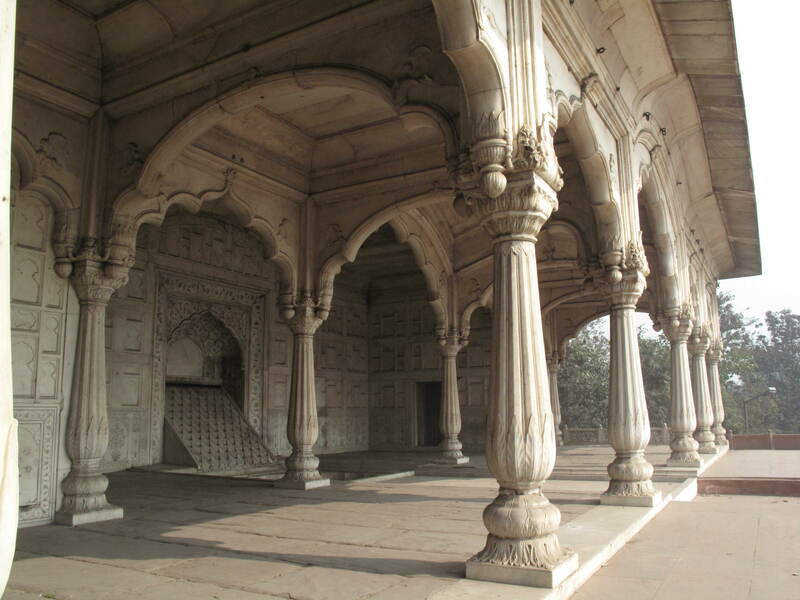 I enjoyed visiting the Red Fort, not only for its crumbling beauty, but also because it was a peaceful place in a crazy city. Ganesh and I then took a bicycle rickshaw ride through the busting maze of narrow lanes in Old Delhi. Our rickshaw driver was as crazy as Old Delhi itself. He careened through the crowded lanes, sometimes locking hubcaps with other rickshaws and one time hitting a car bumper, all the time yelling, “Chello! Chello!” (Move it! Or, Let’s Go!) 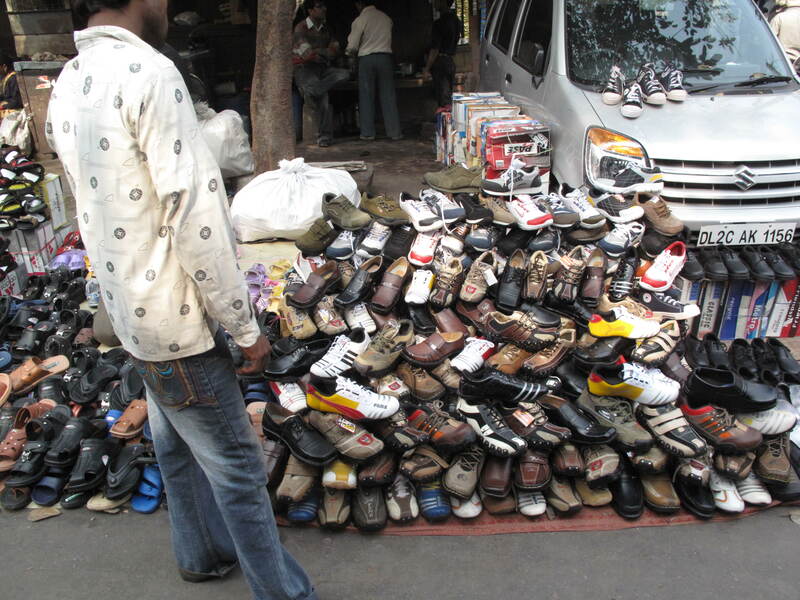 You can buy nearly anything in Old Delhi. 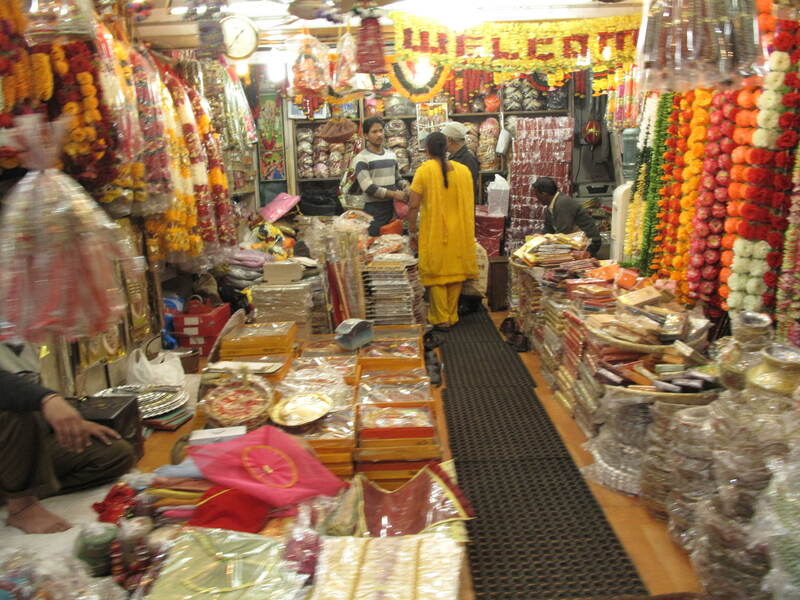 We drove by the wedding shops and the sari shops all filled to the ceilings with every imaginable color. 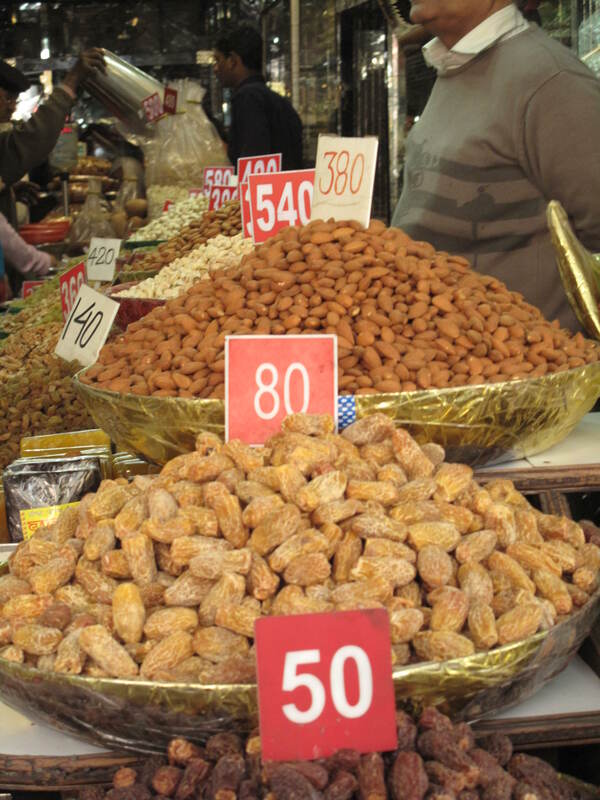 I was the most interested in the spice markets where all the spices are piled in large bowls. Our rickshaw driver parked the rickshaw and took us up the stairs to the upper levels of the market where they trade spices wholesale. Needless to say it was the spiciest smelling place I have ever been. 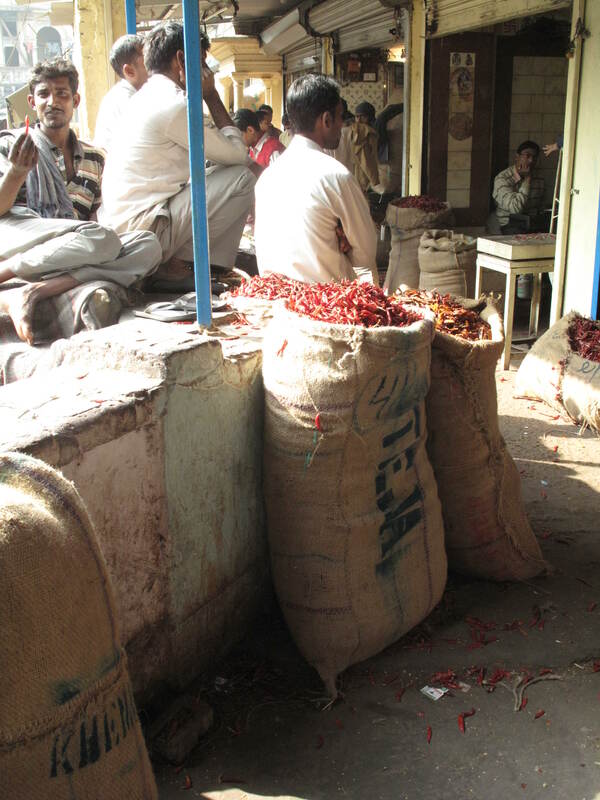 The air was literally laden with chili and a slew of other delicious spices. Even though I’ve been to India before, I am still adjusting to being part of the tourist “caste”. 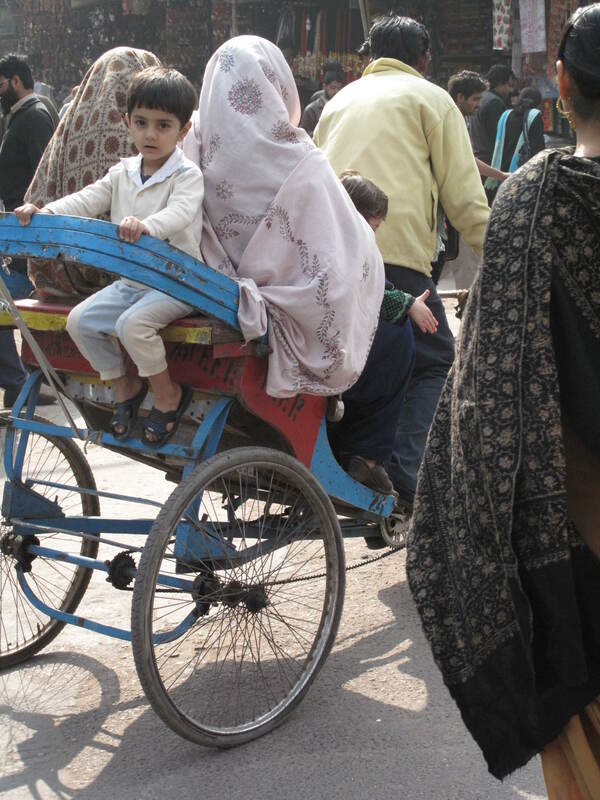 Rickshaw drivers and other “touts” – people that pull you into shops or try to sell you something on the street – are pretty aggressive in Delhi. On this rickshaw ride the driver offered to show us a Jain temple in Old Delhi where we could “take pictures.” Some of the most stunning temples I have ever seen were Jain temples, so I agreed to go inside. Once inside the temple there was no photography allowed! I should have left then, but instead I walked up the stairs where a Jain “priest” in plain clothes gave me a tour of the temple and told me how old the art was. I’m no expert in art, but the tacky mirror mosaics and paintings couldn’t have been more than 15 years old. When he finished lying to me, the plain clothes priest requested a “donation” for the tour and he wasn’t very happy with the 30 rupees I gave him and I only gave him money to avoid a bigger scene. When drivers take you to places to buy things or “donate” money, they often receive a commission. This is common practice in touristed areas. Fortunately, most of my trip will be off the beaten track and it will be easier to avoid “donating” money to the other “plain clothes priests” out there. This entry was posted in Uncategorized and tagged India, Red Fort, Travel. Bookmark the permalink. Hi Kelsi, Good reading about your exciting experience riding cycle rickshaw, encounter with aggressive sellers and donation seeking priest. So, would you recommend another person from your place to go to these places and try out similar stuff? Just curious. Have a good day.